H.L. Zhang was born February 25, 1964 in Beijing, China. At age 10, he was seriously interested in painting. He trained under local master Ke You Ding at Tong District Children’s Home. Eventually, he moved on to the Teacher’s Higher Training Institute. He eventually began his formal academy training at the Center Art College, Beijing in 1984 and later at Beijing Evening Newspaper, The Chinese Art Gallery, Beijing and Tong Zhou Gallery. His paintings can be found in governmental as well as many private collections. 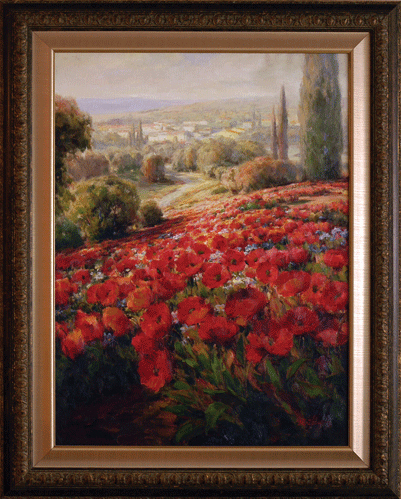 “Poppyfields” is one of Mr. Zhang’s masterpieces. Limited serigraphs of this piece are sold in galleries and were found at the New York Art Expo, further acknowledging this as one of Zhang’s finest pieces.